My syllabi focus on ease of understanding and visual appeal for students. The "long list" of policies and procedures can be found in our LMS (Canvas), but my initial contact with students is made by sending out my shorter stand-alone syllabus a week or so before the start of each new semester. I especially focus on the class learning objectives, which are reiterated throughout the semester as we discuss various content. I prefer to use creative assignments to assess student learning. The students generally enjoy the creativity involved, and they tend to be a bit easier for my team to grade. One of my assignments was inspired by several talks I heard at NITOP (National Institute for the Teaching of Psychology annual conference) on the importance - and difficulty - of debunking myths in psychology. This is a widely applicable issue, so I give a broad enough assignment that students can focus on an area of interest to them. For the assignment, students are instructed to create an infographic refuting one of a list of 15 or so major myths in the field of psychology. They are required to use three separate academic sources and explain why each contradicts the myth. Completing this assignment well involves the ability to find appropriate sources, apply them appropriately to present a logical case, and design the infographic with a creative flair (see student examples). Ambrose, S. A., Lovett, M., Bridges, M. W., DiPietro, M., & Norman, M. K. (2010). How learning works: Seven research-based principles for smart teaching. Brown, P. C., Roediger, H. L., & McDaniel, M. A. (2014). Make it stick: The science of successful learning. Lang, J. M. (2016). Small teaching: Everyday lessons from the science of learning. One of my most important goals is to become a better teacher every semester. Since I teach the same class over and over, it would be easy to fall into a routine and become stale over time. One of the ways I prevent this is by conducting frequent assessments and adjusting components of my class in response to student feedback. I generally conduct two assessments (in addition to the required teaching evaluations given by the university at the end of the semester). One typically occurs in mid-semester, and the other during the last few weeks of the course. The first assessment consists of questions delivered through TopHat, our student response system. I ask questions about exams and homework, the GA’s responsiveness, my teaching style, and more. I also ask them to rank the usefulness of each component of our class in their learning process. If there are any specific issues that arise during the semester, I ask about that as well. I try to keep the answer choices informal and amusing so that I get honest feedback. The second assessment helps me pick out major class themes from the students’ perspective, as well as identify components of the class that may need further explanation. 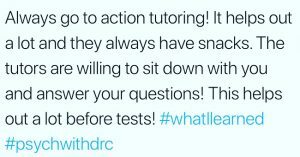 For this assessment, I ask students to post on social media (typically Twitter) tagging our class account and/or using the hashtag #psychwithdrc. Their questions are: (1) what are the major ideas you learned this semester that will stick with you? (2) what advice would you give to future students who are taking this class? I get some rather creative responses. The vast majority of the advice given by students repeats exactly what I’ve already told them to do, but for whatever reason, they had to learn the lesson themselves. However, I do look for overlapping themes that center on elements I can further clarify or reinforce. I also look for content area themes, because I want to know which elements of the class they found to be the most memorable. Those are typically the areas that I focus on enhancing for the subsequent semester(s).